All of this has me in a constant process of considering how we learn, and in particular, that learning is about more than just the transfer of information. That it is about connection to others; exploration of one’s own identity and goals; it is about how one executes on an idea; about finding ways to safely test and experiment; how we factor in the emotional side of building something; of not just following a list of instructions, but modifying it to fit our specific context and personality, and that of those we are trying to reach. I would say that 50% of the value of the class I teach is connection with each other – students working together and with myself – not just the information that is shared. Within the course, I build in multiple ways to interact, to have open discussions, to brainstorm, to include guests who share a variety of viewpoints, of ways that students can work together to get new perspectives, ideas, and motivation. A big part of this is working past barriers, often those that are internal: being overwhelmed, juggling too much, trying to find clarity in vision and process, and just knowing that this is all worth the effort – that there is a payoff. We work as a group to actively move each other forward. 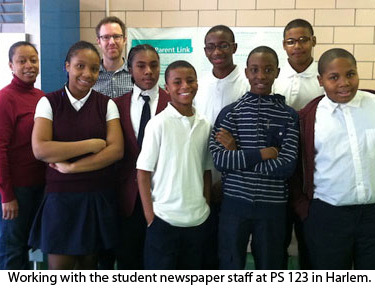 I have worked with an elementary school in Harlem since 2003, helping them build their writing and publishing skills. Coming into the school, spending time with the faculty and students, it is clear that the information I share is only part of the value. Being present in the students’ lives; being there to understand their particular challenges and skills; offering feedback that goes beyond sharing a process or list of tips – offering encouragement and motivation – these things matter as much as any information I share. Providing the smallest amount of validation or support to a student can fuel them for years. This is so much more than just transferring my knowledge to them. There are so many “information products” available on the web. Some are positioned as courses, where information is slowly released over the course of weeks. Others are eBooks, PDFs, white papers, screencasts, and other forms of media. These can each be valuable tools, and they scale well. But my concern is that they may not always address the real challenge standing in people’s way: the very personal set of circumstances they may be in, how to stay motivated, build connections, and deal with the rollercoaster of emotions that most people go through when trying to create a meaningful body of work. As I have stated before, showing is not teaching. Just because one process works for a single person, that doesn’t necessarily mean that someone else in a different context can replicate it. I have worked with more than 500 writers, and I won’t pretend there is one formula that works for everyone. There are tips and frameworks that are massively helpful, but they need to be personalized and modified to fit a certain context. Not everyone WANTS the same thing, has the same desires and skills, the same resources, and the exact same audience. The value of each is unique.